Modio is proud to announce the launch of our proprietary primary source verification service for state licensure, Carbon. Carbon improves upon our existing integrations with state medical boards, bringing you faster and more accurate results. With Carbon’s release, we’ve also added seven new state integrations and PDF uploaders – check out our most updated map to see the services we offer. Full list of states: CA*, CO*, DC, FL, IL, IN, KS, MA, MD, ME, MI, MO, NH, NJ, NY, OH, PA, TX, VA, WA*, WV. 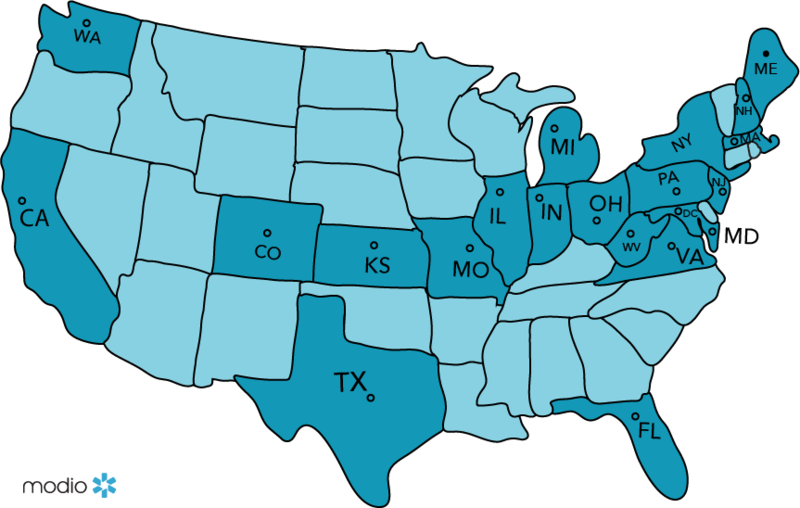 (* states without PDF uploader). Stay tuned for the much awaited California PDF uploader which will be going live next week! Whenever you run a license updater with the PDF service, the file will automatically be named to include last name, first name, state abbreviation, license number, and created date, like this: “Sanchez Mary CA 1234 050118”. Last release, we added the ability to archive and delete documents uploaded within credentialing sections. Now, you can also manage these files directly within the Documents section, too. We’ve also set up some new default permissions for certain document types – now, anything you upload to the Personal Info or Personal Health types will be automatically set to Public for all teams where your provider is a member. The Provider Report has a new column for Created Date to help you figure out when your providers joined. You’re already familiar with the web-based Compliance Report – now we’ve added a downloadable CSV version for easier alert tracking.